Well, it's been a miserable few days around here. After 50 degree weather a week ago we suddenly went up to 90 degrees - and at the same time all the trees started their annual pollen deluge. Everything's yellow. Tom decided to get the cars washed on Saturday - I could've told him he was wasting his time. Just a scant time later you couldn't even tell they'd been washed. Saturday Rachel's preschool had their annual recital. She loved her costume - they did a dance to the Pink Panther theme. It was really cute - they all had these oversized cardboard magnifying glasses. However, the dyed black feathers rubbed off on everything - all the girls had black fingers by the end. And some of them, ahem, black faces where they'd rubbed the feathers under their noses like mustaches. Before the recital (remembering all too well last year's) I asked Rachel if she'd do one thing for me: not stick her shoes in her mouth. "Why not?" was the reply. But at least she didn't. And this year she was in the back row - not the very front. And the most exciting thing that's happened - baby robbins! A pair built a nest in one of our azalea bushes in the backyard. I was surprised because it's quite low to the ground. Four little blue eggs. Until Monday when we noticed that there were four little baby birds. This was the best shot I got - I used our 55-200 mm lens so I could stand back aways, but I never got all four mouths together. But trust me, they're all there. I just realized I spent so much time preparing my class that I haven't posted my April Scrapbooks Plus work. This month I got to put together the kit - we used the Bloom&Grow collection from My Mind's Eye, some Co-ordinations cardstock, and some fun stuff from Bazzill Basics. For the accents I used a bit of white-washed Co-ordinations cardstock. I used a plastic embroidery circle thing I picked up at Michaels that has a nice grid to emboss the paper. Then I lightly sanded over the top so that the pink showed through. Finally, I punched out a few circles with my punches and voila! For this layout I tried my hand at Yo-yos. You can get a template at your local craft store that works like a charm. I also modified one of those plastic things (above) to use as a template for the larger yo-yo. Lots of fun, easy to make - I'll be trying this again. And, our next Method Playground challenge is up. Perfect for Earth Day - we're recycling! The challenge is to incorporate something from a magazine into your project. I used several different patterns from a House & Garden magazine to decorate chipboard peices. After adhering the paper to the chipboard I covered it in a layer of UTEE. So we finally had a glorious weekend here -- 73 degrees on Saturday and sunny! Whoo hoo. We were seriously doing a major happy dance. Followed by major yard work. I coerced Tom into helping me dig up some very large and woody perenials on the side of the house. I really thought we were going to need a hatchet to get them out. In there place a Scottish Broom. I *love* this plant. We had several of them in our yard in Rhode Island. Minus the one I killed by the mailbox by overzealous pruning - which my husband loves to remind me. He made me raise my hand and promise not to come near this one with anything sharp. Then, in the car this afternoon the kids are talking and playing (Star Wars, of course) when I hear Thomas tell me, "Ashoka's from the planet Unk - nown." Yup. Just like the word. Funniest line of the week. And for all you Twilight fans out there, I ran across this link the other day. It's a fan fiction story of the Cullens - Edward, Bella and the rest - going to the movie theater to watch the Twilight movie and their comments as they're viewing it. Hilarious! It's April 15th - tax day -- and here in Virginia it's cold, rainy and just dreary. Oh, and I have a dentist appointment this morning. Well, here's something positive I found - check out the companies like Maggie Moo's that are offering tax day freebies. I'll be taking the kids (or at least one of 'em) out for a cone this afternoon. Our current challenge is using frames on your LO. Multiple frames. Lots of 'em. I took this as a good excuse to go through my stash and pull out what I had. The result -- I've got things from Making Memories, Heidi Swapp, and KI Memories, plus a clear frame that I stamped with Stazon ink and a Tim Holtz stamp. It's time for one of my favorite Easter things - the Washington Post Peeps contest. This contest really gets better every year. You can view the top 40 entries online here since I can't figure out how to link to any of the pics. The kids love the Peep-E entry (a take-off on Wall-E) while Tom and I were partial to Sweeney Todd, the Demon Barber of Peep Street. But the one we all thought should have made the top 5 is Steve Jobs Presents iPeep Nano. Just brilliant. So we got the eyes dyed -- along with our hands. Got the kids bathed & into bed shortly after 9. We're hanging out on the couch watching the Ten Commandments waiting for them to fall asleep so we can get our preparations going. Around 9:45 we hear this coming from Thomas's room: "GO TO SLEEP!" At first I think he's yelling to Rachel, who's probably singing in her room. Nope. He's yelling at us and follows it up quickly with "The Easter Bunny won't come if you're up!" He's very excited -- both of them are -- and is quite anxious about Mr. Bunny's impending arrival. So we snickered to ourselves, quietly. It was the 2nd funniest thing he's said today. He's been in an Indiana Jones mood today and decided to don his hat and impromptu bag for our dinner out. We made him leave the whip at home. So he starts quizzing us on aspects of the movies - which he's only seen parts of via youtube Lego videos. He asks us what a crusade is, the conversation takes off .... until he asks us about the "holy griddle." At which point we both just lost it. OK, there are some things in this world that are just not right. Like turning on Noggin for the kids and finding Jack Black as the guest on Yo Gabba Gabba. They even got him in the orange outfit and hat. The kids ran and jumped on me this morning (after a little prompting from DH) with big smiles saying "Happy Birthday." Then their minds started working and they started thinking out loud very excitedly. 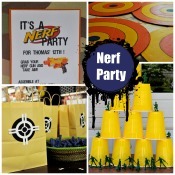 A few choice gems: "Mom, you need to buy a birthday cake," "We need a party for Mom with goody bags for me and Thomas. And party hats!" and "Mom, you can invite all your scrapbook friends over for a party." Well, goody bags sound pretty good right about now since we're having a thunderstorm. The kids have been saying "Mom it's your day what do you want to do?" 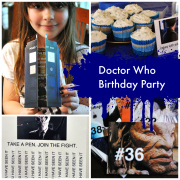 Remember when you were a kid and your birthday was really special? How fun was that! Instead, welcome to the adult world where you're home with crappy weather, a good chance of water in the basement, and laundry. Wonder how long it'll take before they hit me up to take them to the party store so they can get things for "my" birthday? Anyone want a goody bag?? Although I have to warn you, it'll probably be Star Wars- or Hanna Montana- themed. After a rough Monday I decided to treat myself to the Twilight movie - who knows how long it'll take to get here via Netflix? And anyhow, we put Beverly Hills Chiuaua next on the list for the kids. So after the kids zonked out I got my comfy jammies on and settled back to watch it in HD. Loved it. The scenery and interiors were much larger and more colorful than I had imagined. Especially Bella's house - I had a mental image of a very tiny 3-room house when I was reading the book. And the Cullen's house looked nothing like I imagined. I hadn't expected it to look so modern from the front and I'd kill for a tour of the thing - it was gorgeous! Liked the actors & characters - except for Jasper's weird bug-eyed staring. And Bella wasn't as annoying in the movie as in the book - probably because the writers were smart and didn't have her pestering Edward to change her into a vampire except at the very end. Here's hoping they keep that up in the New Moon movie as well.